Normally I’d encourage people to keep their system / app up-to-date, but there is only one word that can describe what Microsoft had done in Office for Mac: catastrophe. Their Apr 2018 update destroyed the ability to display / assign Asian font correctly. Prior to the update, I can view & set Asian font using the Asian name of a font family (e.g. "細明體" instead of "PMingLiU"). But after update all fonts are displayed using English font family name. I can stil use these Asian fonts, but it's no longer be compatible with Windows version. Besides, the performance is severely declined after update: the text input curser can’t even catch up with my typing speed. I've managed to revert to older version via Time Machine backup. This is not the first time that Office update ruined everything so I'd always make backup before applying for update. Now I just want to stop this annoying prompt. If you get Office from the Mac App Store, that handles all updates. You can delete your old version of the app and get It from Apple now. You do need an office 365 license, so if you have volume license or an older type license the App Store might not work for you for free. If for some reason you are getting the app elsewhere, the usual way is to open updates from the word help menu and enable manual update checks. 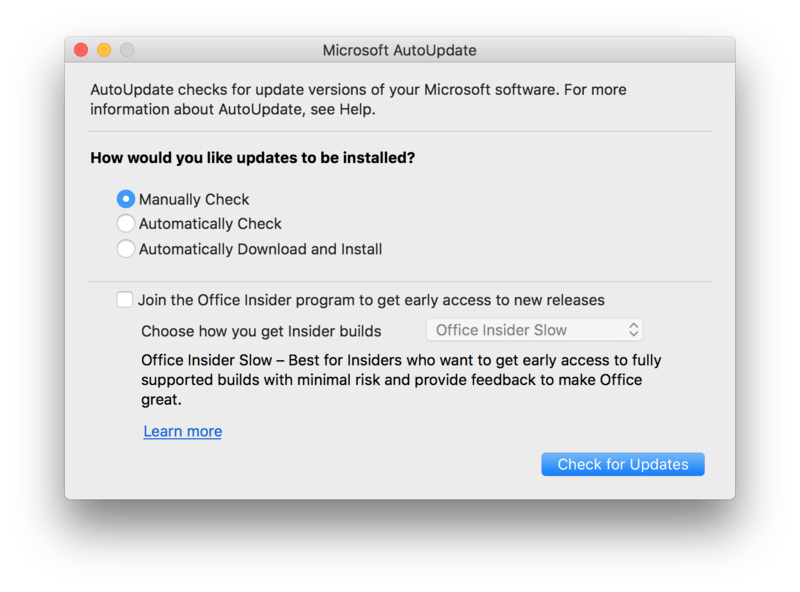 The Microsoft Auto Update program (MAU) is undergoing pretty rapid and dramatic improvements including the ability to set preferences to control updates as well as command line updates. Check this site and link for details as well as links to old versions of apps if you decide you need to roll back an update or manually update part of Office 2016 and not Word. Remove the "/Library/Application Support/Microsoft/MAU2.0" folder. Apparently, this Microsoft employee has published a script to specifically suppress this update prompt. I haven't tested it, but the source is there to analyze. Not the answer you're looking for? Browse other questions tagged ms-office software-update font microsoft office-365 . Office Excel 2016 update not applying.